Neonatal tetanus shows in which among the following? 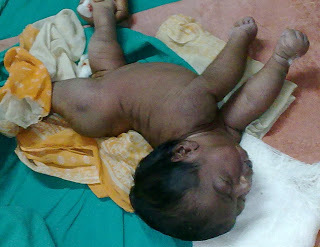 Neonatal tetanus occurs frequently in developing countries as a result of inadequate maternal immunity and poor hygiene, especially around the necrotic umbilical stump. Localized tetanus has been reported, involving rigidity and spasm only in the affected limb. Cephalic tetanus is uncommonly associated with head wounds and involves primarily the cranial nerves.